Learn a bit more about the Summoner’s Rift so you can apply strategies for your games! Knowing a bit about the maps is helpful for positioning and tactics for games. I will however focus on Summoner’s Rift as it is the only one used so far for League of Legends competitive play (where the pro scene is concerned). If there’s a request to review another map, I’ll take the time to make it as part of the extras of this overall guide. For this map guide, I’ll be highlighting the lanes, ward placement and buffs in the jungle. 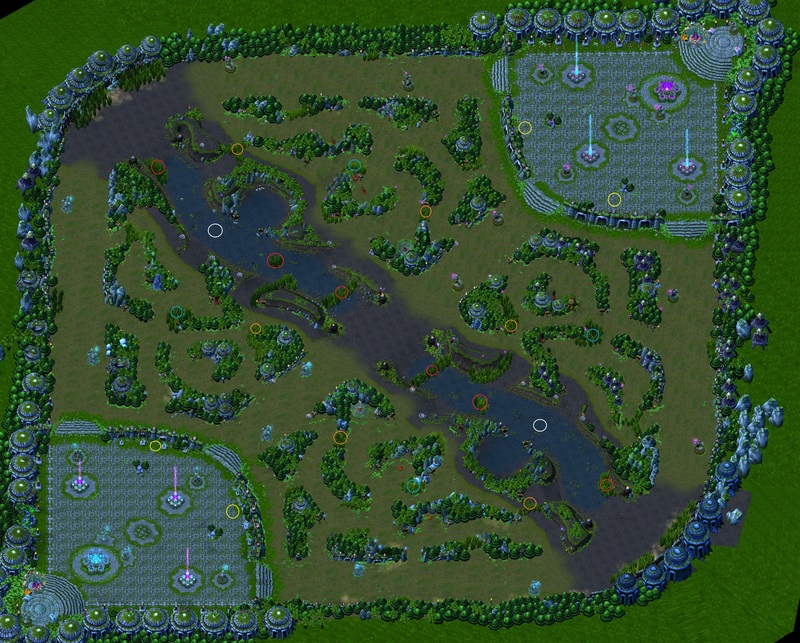 Note that Summoner’s Rift is a mirrored map from the top right corner to the bottom left with the river as the dividing line. Note that the map images I’m using are from Season 3 (couldn’t find a decent Season 4 map) so the bushes are slightly different the areas they’re in are pretty much the same. 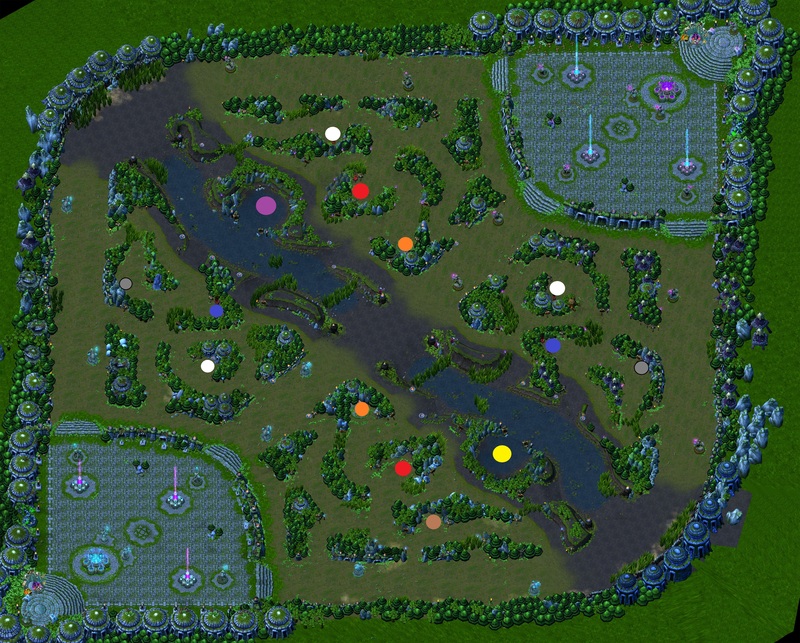 Each section will have an image highlighting the important stuff on Summoner’s Rift with a detailed explanation following and they’re all color-coded so let’s dive right in. As in most MOBAs, Summoner’s Rift has 3 lanes: Top, Bottom (Bot) and Middle (Mid) lanes. The meta game as it currently stands is the Caster (AP Carry) or Assassin in mid lane, Marksman (Attack Damage Carry) and Support in bot lane, a Fighter or Bruiser in top lane and a Bruiser or Tank as the jungler. Sometimes you’ll see odd champions in lanes that work in order to counter play the enemy such as the Marksman and Support in Top lane versus the single enemy top laner. The following parts for this guide in the coming weeks cover these roles but right now let’s first look at the inanimate objects in the lanes and base that make up the map. The main objective of the game to destroy. A team wins a match when the enemy Nexus is destroyed. Each team’s Nexus is located deep in base. The mini-Nexuses in the base. There is one for each respectable lane in each base. When destroyed, the enemy Nexus will spawn super minions in the lane where the inhibitor is destroyed. These super minions stop spawning when the inhibitor respawns. Inhibitors are the only objective objects in the game that respawn after time. Fountain Turrets – Not really recognized much but it is the turret located at the Summoner’s platform in the base (where players load into the match). These are super turrets because they are indestructible and attack any enemies that walk onto a team’s platform. These turrets literally melt an enemy’s health if within range for 1 to 5 seconds. The wolf camp (left image above) consists of 3 wolves, 2 small ones and one large one. This camp respawns every 0:50 seconds to 1:15 minutes (as the match goes on) upon death of all the monsters in the camp. The wraith camp (middle image above) consists of 4 wraiths, 3 small ones and one large one. This camp respawns every 0:50 seconds to 1:15 minutes (as the match goes on) upon death of all the monsters in the camp. The golem camp (right image above) consists of 2 golems, one small one and one large one. This camp respawns every 0:50 seconds to 1:15 minutes (as the match goes on) upon death of all the monsters in the camp. The Ancient Golem Camp (left image above). You can get Crest of the Ancient Golem aka blue buff or blue. This buff gives the user cooldown reduction and mana regen over time. This buff lasts 2 minutes and 30 seconds but lasts 3 minutes with the Runic Affinity mastery. The Ancient Golem respawns every 5 minutes upon death of all the monsters in the camp. The Elder Lizard Camp (middle image above). You can get Blessing of the Lizard Elder aka red buff or red. This buff gives the user the ability to slow & does damage over time that resets with each basic attack on an enemy champion. This buff lasts 2 minutes and 30 seconds but lasts 3 minutes with the Runic Affinity mastery. The Elder Lizard Camp respawns every 5 minutes upon death of all the monsters in the camp. The Wight Camp (right image above) is a new camp introduced in Season 4. This camp consist of one large Wraith called a Wight. This camp respawns every 0:50 seconds upon death. The Dragon (left image above) is a monster in the bottom half of the river that gives the team that kills it 125 to 260 gold each (as the duration of the match goes on) with 25 more gold to the champion that kills it. Dragon attacks the closet champion and does damage over time. Dragon first spawns at 2:30 and respawns every 6 minutes upon death. Baron Nashor (right image above) aka Baron is a monster in the top half of the river that gives the team that kills it 300 gold each and the buff Exalted with Baron Nashor to each team member alive when Baron dies for 4 minutes. This buff gives the user additional attack damage, magic damage, health regen and mana regen. Baron first spawns at 15 minutes respawns every 7 minutes upon death. As I’ve said in the first post of this guide: Wards Wins Games. I know it may be weird at first to know where to ward so the image above shows some ideal areas to ward starting out. The goal of wards is to see where the enemy is in order to make an informed decision of whaT to do next. You’ll figure out other areas of warding as you play more matches. Do note that wards in a brush gives vision of the area including things in the brush (of course invisible units don’t count unless you use a Vision Ward). This also give you a general idea of where to use your sweeper trinket or pink wards in order to clear wards. 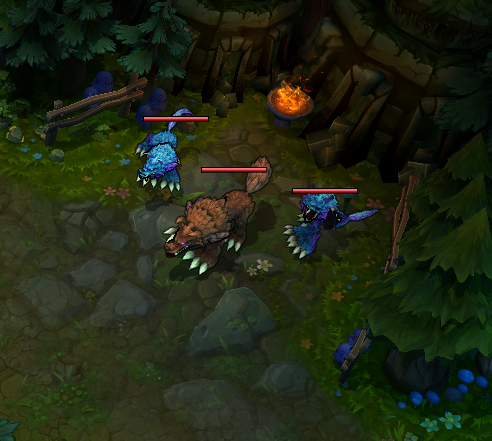 Another thing to note is that Vision wards are visible to the enemy but have 5 hit points. You have time to catch or scare away an enemy champion if they try to kill your ward. Invasion Wards (Orange) – These wards prevent level one invasions, jungle invasions and ganks from your side of the jungle. At the very least, vision of those invasions so lanes can know where people are in order to have good information to take action. River Wards (Red) – These wards ensures safe lane phases from ganks. If each lane and the jungler wards to the river top to bottom, you will have complete coverage of the river which is ideal. Buff Wards (Light Blue) – These wards ensure the safety and vision of the red and blue buffs in case of invasions. 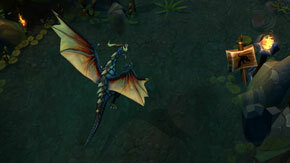 Dragon / Baron Wards (White) – These wards give vision of the Baron and Dragon in order to protect these monsters from going down by the enemy team. 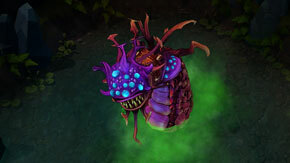 Usually a Vision Ward (aka Pink Ward), which reveals invisible units are used here in order to clear out any enemy wards. Dive / Skill Shot Wards (Yellow) – When your team is sieging a base it’s quite useful to ward on the other side of the base in order to throw some skill shots off to wear down the enemy team or prep for a dive. Some other “types” of warding that are useful are brush and lane wards. Brush wards are always useful if you need vision in it (for example top and bottom lane brushes). 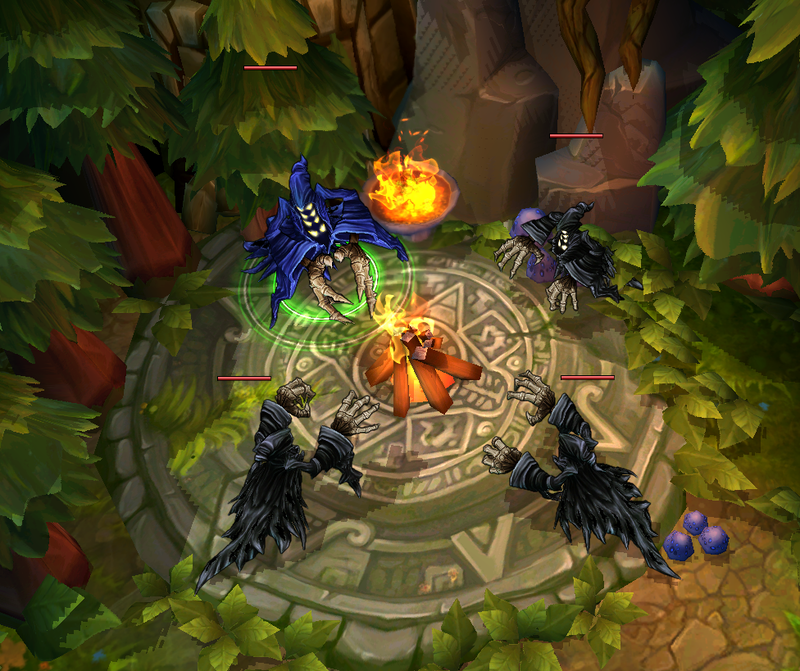 There are also lane wards where when a tower deep near or in the base is taken, you place a ward there in order to see if an enemy champion is farming or grouping up in that position. And that concludes the guide on Summoner’s Rift. Hope it was helpful! Posted on May 3, 2014, in Games, League of Legends and tagged guide, how to, League of Legends, LoL, riot games, summoner's rift. Bookmark the permalink. Leave a comment.